Find more about asthma symptoms, allergy and immunology, allergy and asthma treatment, from the natural health viewpoint and alongside classical medical treatment. 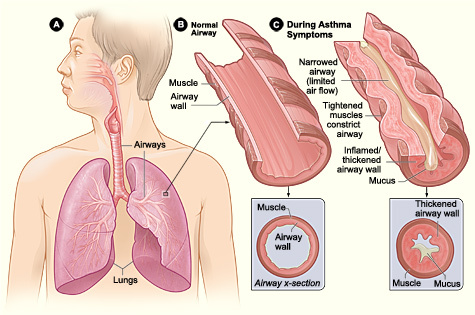 Asthma ( asma / asma attack ) – is a chronic inflammatory disease of the respiratory system and its airways. It is very common and is characterized by reversible airflow obstruction and broncho spasm. Common symptoms are coughing, wheezing, chest tightness and shortness of breath. Asthma is an allergic disease and symptoms are worsen in the presence of allergens and irritants or psychological stress. Symptoms are usually worse at night and in the early morning or in response to exercise or cold air. Asthma like symptoms can also be found in young children with hypersensitive airways, especially when contacting a respiratory syncytial virus and rhinovirus. These types of viral respiratory infections may increase the risk of developing asthma in children. Medications used in the treatment of asthma are divided into two classes: quick-relief medications used to treat acute asthma attack symptoms; and long-term control medications used to prevent further exacerbation. For short-term relief or quick-relief are used bronchodilators and for long-term management are usually used corticosteroids. Long-term use of corticosteroids, especially when ingested, carries risk of adverse reactions, such as cataracts and stature regression or slow growth in children. Long term exposure to salt aerosol was also found to be effective in desensitization of the respiratory mucosa to inhaled allergens.3 The salt particles are under 5 microns and are able to penetrate in small airways and due to natural salt properties, clean the mucus and reduce the inflammation in the whole respiratory system. Here are more salt therapy clinical studies. – include Turmeric in your diet – Turmeric contains a compound called curcumin, which helps in reducing inflammation; it lowers two inflammatory enzymes called COX-2 and LOX found to be high in asthma. Curcumin is also a potent antioxidant, helping in your general health.